Flasks against an Oxford skyline. Chemistry is a wide-ranging science concerned with matter at the atomic and molecular scale. Important aspects are synthesis, structure, reaction mechanisms, properties, analysis and transformations of all types of materials. Chemists are a constant source of innovation: it is hard to imagine any product introduced in recent times that did not require the creative efforts of a chemist. 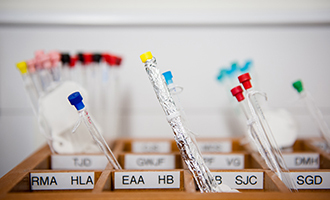 Chemistry underpins the conceptual framework and methodology of biochemistry and molecular medicine and is at the heart of many major industries. 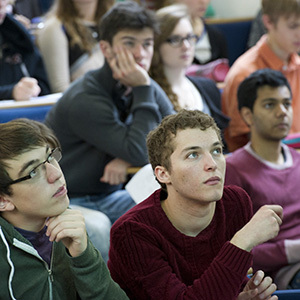 Teaching and research are closely linked on the course: Oxford has one of the leading chemistry departments in the world with state-of-the-art teaching and research laboratories and world-class research in a broad range of areas including: synthesis and catalysis; medicinal and biological chemistry; sustainable energy; advanced materials; innovative measurement; and theoretical and computational chemistry. Students starting in 2020 will be taught an exciting new practical course in our recently-built lab. The department has an outstanding track record in commercialising the innovative work of research staff, which has raised millions of pounds for the University. The MChem is a four-year course and is not modular, in the sense that the subject is taught and examined as a whole, enabling us to explore the links within the subject. The core material is taken by all students, with opportunities to specialise later in the course. The fourth year (Part II) is devoted exclusively to research – a distinctive feature of Chemistry at Oxford since 1916. The fourth year (Part II) of the course involves full-time work within an established research group, which offers the possibility for a few students to spend time at laboratories in industry or at universities abroad. Many students find work placements during vacations through the Careers Service and there are some opportunities within the department. Tutorials are usually 2-4 students with a tutor. Class sizes may vary but would usually be no more than around 15 students and can be as small as four. Most tutorials, classes, and lectures are delivered by academic staff who are members of the department. Many are world-leading experts with years of experience in teaching and research. Some teaching may also be delivered by postgraduate students who are usually studying at doctorate level. Part II (the fourth year) involves full-time work with an established research group. Devoting the fourth year exclusively to research has been a distinctive feature of Chemistry at Oxford since 1916 and this will give you research skills that are highly valued by both academics and employers. This final research year of the Chemistry course has three extended terms of 12 to 13 weeks (instead of the normal eight weeks) and is 38 weeks in total. The practical element of this course is currently under review. Up-to-date details on any course changes can be found on the Chemistry website. A-levels: A*A*A (including Chemistry and Mathematics) with both A*s in science subjects and/or Mathematics. See the full list of subjects in which an A* grade will be acceptable. Essential: Candidates are required to have Chemistry and Mathematics to A-level, Advanced Higher, or Higher Level in the IB or any other equivalent. In IB, Mathematics 7 at SL is also acceptable only where students have taken Analysis & Approaches. Recommended: An additional science or Further Mathematics are also recommended. All candidates must take the Thinking Skills Assessment: Section 1 (TSA S1). Separate registration for this test is required and it is the responsibility of the candidate to ensure that they are registered for this test. We strongly recommend making the arrangements in plenty of time before the deadline. Everything you need to know, including guidance on registration and preparation, can be found on the TSA page. Tutors are looking for evidence of academic excellence and motivation, as well as the potential for advanced study, a capacity to analyse, explain and apply current knowledge, and a readiness to have a go at problems even when you cannot see how. For more detail on the selection criteria for this course, please see the Chemistry website. Chemistry provides an excellent opportunity for the development of your critical faculties and intellect, and also instils important transferable skills that will serve you well, whatever your subsequent choice of career. While about 55% of our Chemistry graduates go on to do research or further study, others enter professions such as scientific journalism, consultancy, patent law and teaching. Long term, more than half our graduates remain in posts related to chemistry in some way. The Royal Society of Chemistry provides further information about careers using chemistry: www.rsc.org. Students in their fourth year undertake full-time research under the supervision of a member of the academic staff. This final year has three extended terms of 12 to 13 weeks and is 38 weeks in total, so you will need to budget for higher living costs in the final year, as you will be required to be in Oxford for longer than the standard terms. (See the likely range of living costs for an additional month in Oxford.) 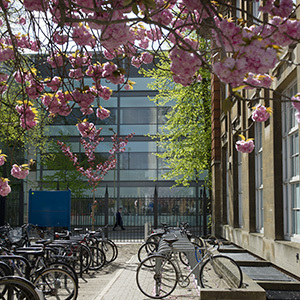 This final year, which is entirely devoted to research, is a unique feature of the Oxford course, and will give you research skills that are highly valued by both academics and employers. 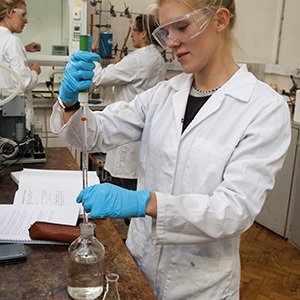 Why not have a look at the introductory reading list for Chemistry recommended by our tutors? You may also like to have a look at Chemistry World magazine, and see other resources on Chemnet.